Wickaninnish Inn is a celebrated luxury hotel in a pristine natural setting in British Columbia. It sits at the end of the road on the scenic coast of Vancouver Island. The island's famously dramatic weather draws winter storm-watchers from all over. Wickaninnish Inn is It is a member of the ultra-prestigious Relais & Châteaux association. It was voted by Travel + Leisure readers as their #1 Canadian resort in 2012, 2013, 2014, and 2015. The inn is owned by the visionary hotelier Charles McDiarmid, who built his hotel himself with help from local artisans and his father, a country doctor. Wickaninnish Inn opened in 1996. The original building, The Pointe, houses a restaurant which affords spectacular views of Clayoquot Sound, a UNESCO Biosphere Reserve. The hotel's ultra-modern Beach Annex was added in 2003. 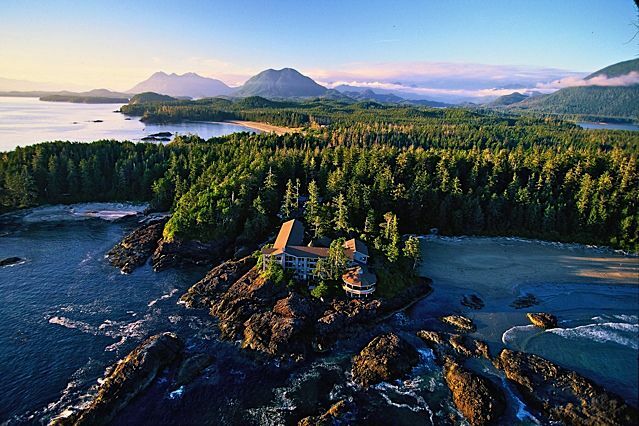 Wickaninnish Inn is located in Tofino, Canada, on the west coast of Vancouver Island. which Travel + Leisure readers voted as North America's Top Island. Tofino's setting, where woods meet roiling surf, is mesmerizingly beautiful. The inn is a picturesque five-hour drive from Victoria, or a short, equally scenic flight from the City of Vancouver. The town of Tofino, which has many good restaurants and boutiques, a brisk-20 minute walk from the property. Chesterman Beach, adjacent to the hotel. Several hiking trails that meander around the coast. The Carving Shed, where much of the hotel's unique wooden furniture and decorative pieces were created by celebrated wood carver Henry Nolla and his team. Will Wickaninnish Inn Be the Right Vancouver Island Hotel for You? The 75 rooms and suites at Wickaninnish Inn are beautifully designed and quite luxurious, with handmade wooden furniture, ample closet space, and complimentary wifi. The Chesterman Beach Loft Suite boasts a gas fireplace, a king bed plus a queen convertible sofa, a gourmet kitchen, and duplex accommodations in 1,100 square feet of living space. My Deluxe Room at Wickaninnish Inn was spacious and sunny. Its panoramic windows looked out onto a Pacific tidal bore, lush with marine life. Room drawbacks at Wickaninnish Inn are virtually non-existent. The owner, Mr. McDiarmid, and his staff have thought of everything. Dining is of a high order here, with several options. Wickaninnish Inn's fine-dining restaurant, The Pointe, is a deluxe dining experience with a panoramic ocean view and reasonable tabs. Chef Nicholas Nutting gets the big picture, too. He specializes in farm-fresh organic food. Delightful signature dishes include potato-crusted oysters and fresh halibut with yogurt sauce. The Pointe is a destination for its wine list, strong on British Columbia wineries; it's chocolate desserts; and its Sunday Champagne Brunch. The Pointe's bar hand-mixes creative cocktails. Some have a campfire theme and may feature grilled marshmallow garnishes. An extensive list of single-malt Scotches includes some with a smoky peat flavor. Room service at Wickaninnish Inn features The Pointe's menu. Guests can enjoy brunch items such as quinoa-crusted Tofino salmon, or Berkshire pork with baked beans and a poached egg. The room-service dinner menu covers dishes like grilled Pacific octopus or Dungeness crab with bone marrow. Driftwood Café is a serene, quiet room where coffee and pastries are served. In-between dining indulgences, Wickaninnish Inn guests can visit its fitness center and take in its ocean view. Wickaninnish Inn's full-service Ancient Cedars Spa is a hushed sanctuary designed almost entirely of cedar wood.